I’ve figured out the best strategy for gift buying: purchase a gift card for an activity that you’d like to do, and then gift it to whomever is entitled gifts for whatever occasion, promising them that you’ll be there at their side when they want to redeem it. Foolproof. 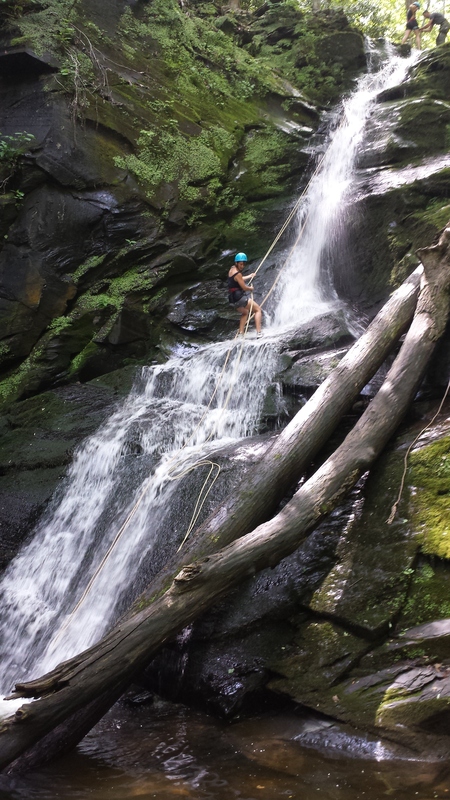 This is both a short look into what a selfish human I am, as well as an explanation for how my cousin and I found ourselves rappelling down a waterfall in the Delaware Water Gap earlier this month. We booked the trip through Northeast Mountain Guiding, a New Jersey based outdoor adventure company that’s been in business since January of 2009. 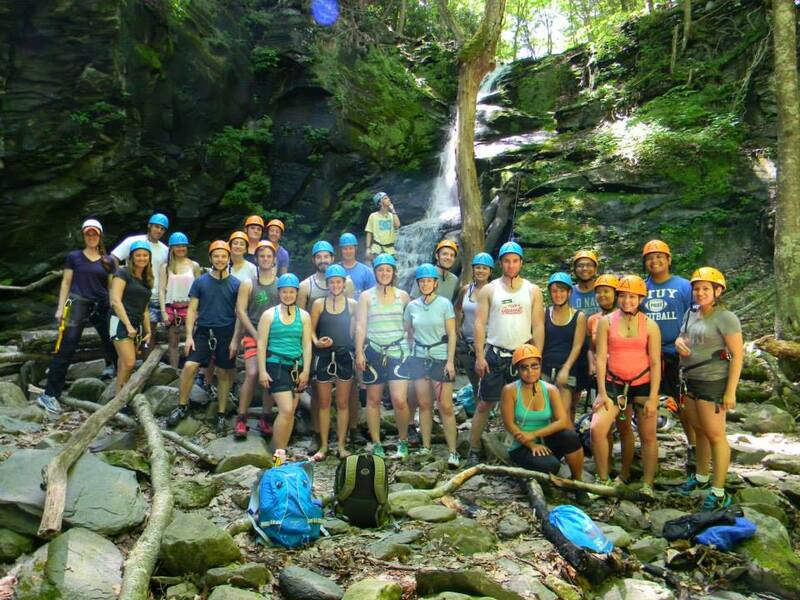 In addition to waterfall rappelling (which happens to be one of their most popular day trips), they run rock & ice climbing, kayaking, hiking (yoga hikes are another one of their most popular offerings), snowshoeing, and courses for wilderness medicine and survival skills. While we just did a day trip, you can take much longer treks with them, and they have offices in the aforementioned New Jersey, North Carolina, Arizona, and even abroad. 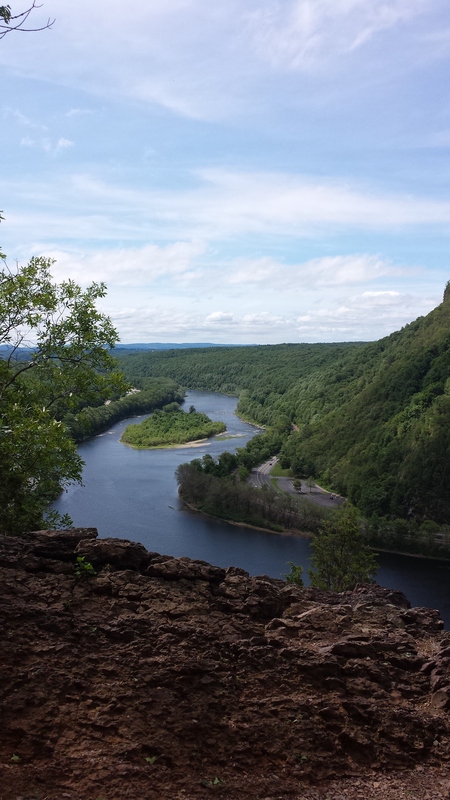 The trip we booked was in the Delaware Water Gap. 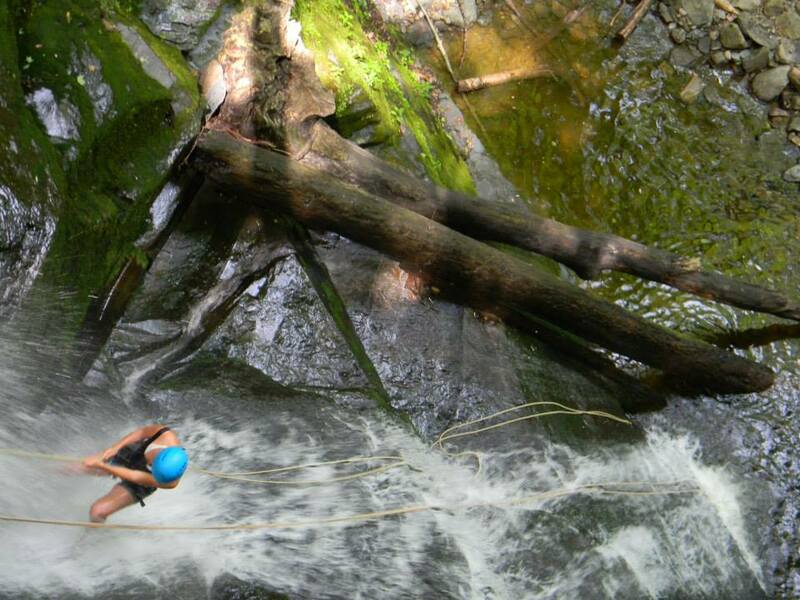 We’d be rappelling in Slateford Creek, a creek that feeds into the Delaware from the Pennsylvania side of the gap. 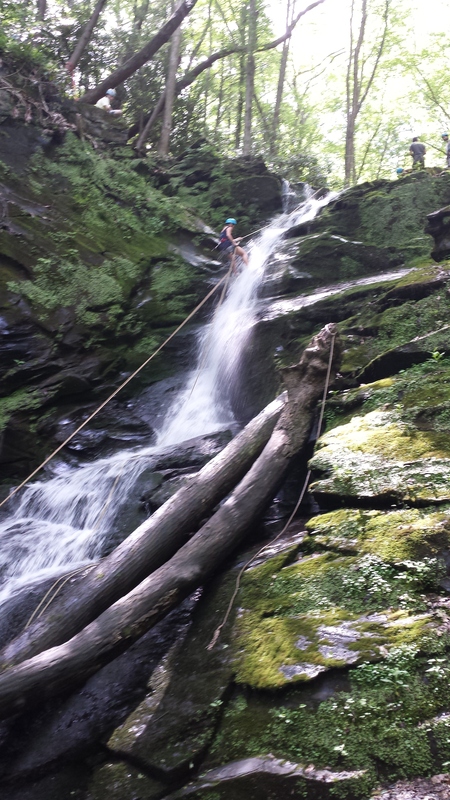 Slateford Creek is home to several waterfalls, and if you’d like a little more information on that, check out this write up by Jim at UncoveringPA. Slateford Falls is 60 feet high, and not a completely sheer fall, so I thought this fell right on the threshold of scaring me enough to not be easy, but not so high that I’d have a panic attack and embarrass myself. 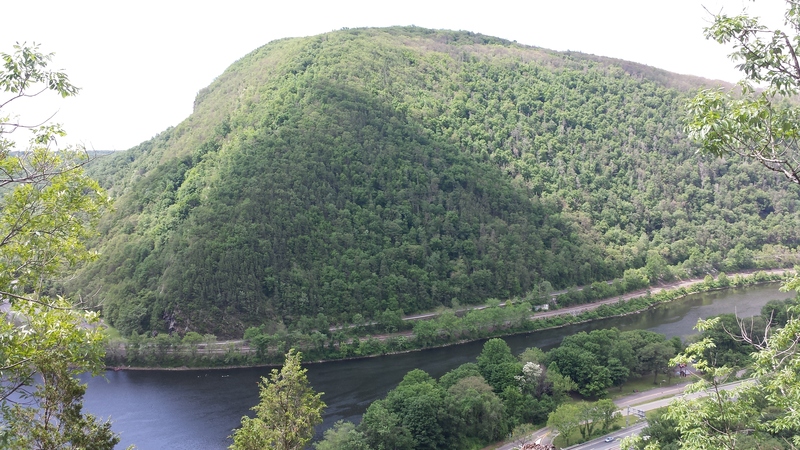 Our session started at 1:30, but my cousin Casey and I wanted to make a day of it, so headed to the Water Gap in the morning to hike Mount Tammany, on the Jersey side, something I’d attempted, and failed to do this past winter snowshoeing. I always forget what a popular tourist destination the Poconos are, because when we arrived at around 10:30, the parking lot was absolutely mobbed. Luckily, the trailhead shares a parking lot with many others, so while it wasn’t empty by any means, it wasn’t as annoying crowded as we initially feared. Mt. Tammany is a pretty decent hike, especially in the morning when you want something to get you going, but not exhausted. What did exhaust me were the trail runners who double and tripled looped us on our way up and down. I mean, good for them, I just don’t think I even have it in me to ever want to attempt that. What was crowded and very strange was the summit. There was a group of 15-20 people (maybe a family reunion? We were attempting to figure out their purpose) doing a semi choreographed dance to “Mambo Number Five.” Another couple sat at the top of this gorgeous mountain watching The Walking Dead on an Ipad. It was too early to take most of this in, so we only stayed briefly, before heading down the mountain. 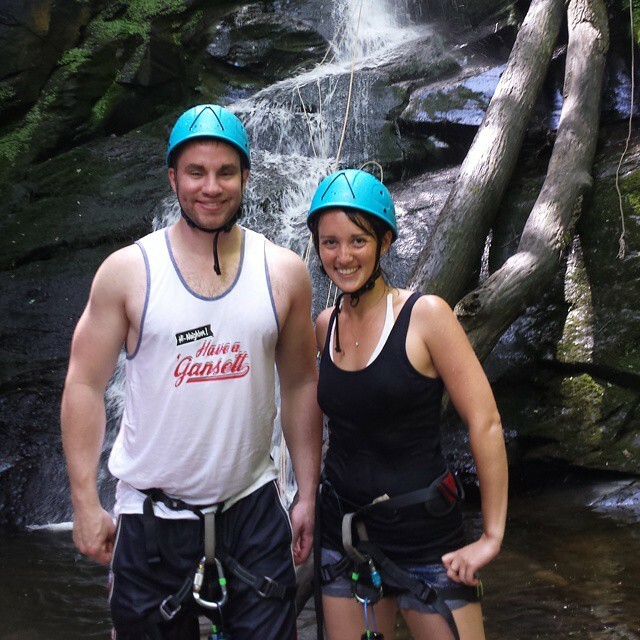 Plus, we needed to rappel! The view from Mt. Tammany’s summit. 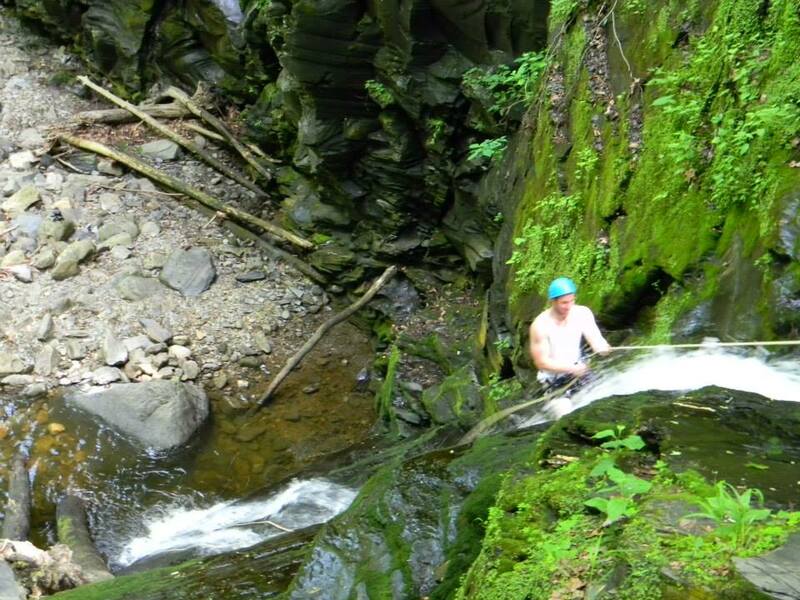 We did group rappelling because it was a little bit cheaper. You could also call and book a private outing, which to be honest, I’d probably do in the future. We were with 25 other people, which wasn’t bad, but if you’re in a smaller group, you could obviously rappel more than the twice we were able to do it. We met one of our guides at the Slateford Creek Parking lot (the directions on the website were very easy to follow), and hiked about a half mile to our waterfall destination. Here, two other guides, who’d gotten all the rappelling equipment set up, met us and gave us a quick safety spiel, and gave us our helmets and harnesses. There was a lot less safety talk and strategy then I expected, but it made sense why. First of all, rappelling is very safe. Unless there’s a freak rope break, there’s virtually no way to fall. It’s also very easy. 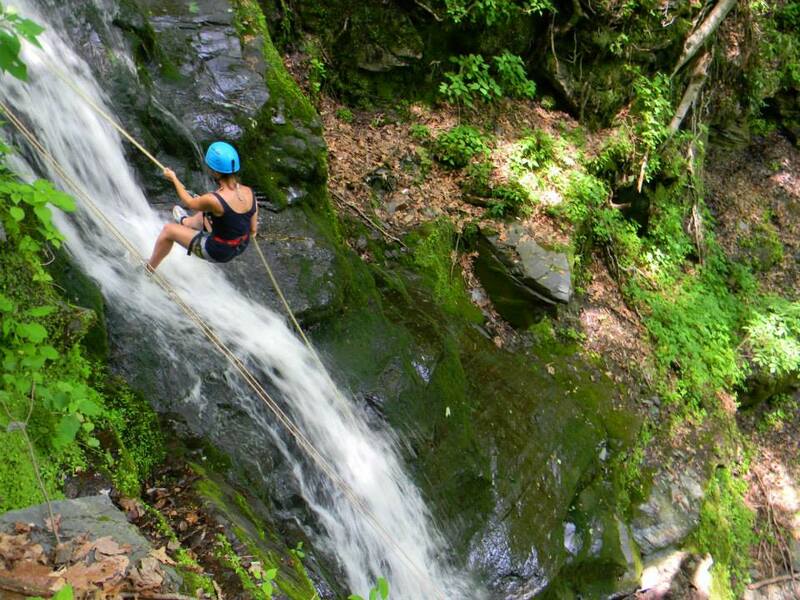 If you could walk and operate your hands at the same time, you can rappel. About ten minutes or so after getting to the base of the waterfall, we climbed to the top and were ready to begin. I volunteered to go second. I didn’t want to go first and mess up, but didn’t want to have to endure hanging out on top psyching myself out. I was surprised how calm and chill I was getting hooked up and started, and once I took my first step backwards over the fall, I realized that while easy, there was a level of concentration required that didn’t allow me to focus on how high I was. Not to pat myself on the back, but I think I was pretty good at it. Casey and I, along with two other girls, were the first four down, and our guide remarked how quick we were. I definitely got the type of adrenaline rush I was looking for, which made waiting on the bottom a lot more manageable. That was my only complaint, that after going first, we had to wait for everyone to make it down, and no everyone was as quick as we were. Still, credit where credit is due, the guides allowed everyone who wanted to rappel a second time to do so, even though I’m sure we were there longer then they would’ve liked. Another plus is that they take pictures and upload them to their Facebook page for you, and you don’t even have to purchase them additionally. Self satisfied, at the bottom. All in all, this was great fun, and comes highly recommended. I look forward to doing another course or expedition with them in the future.